Hereford Racecourse is primarily National Hunt racing with riders travelling in a right handed direction. 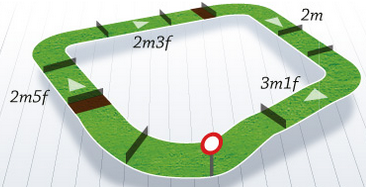 The square course is 1 mile 4 furlongs with 9 fences as obstacles in the National Hunt and only 6 fences on the hurdles course. The course at Hereford has been around since August 1771. There was a closure in 2012 but it is now back in the racing industry as a great course for local trainers and stables. The course is relatively flat with but as typical with square racecourse the bends a sharp making it vital to bet on experienced jockeys. Hereford Racecourse is a big test for both horses and jockeys and it is recommended to back horses that have had course and distance form. Jockeys like to be in front coming out of the final turn on the home straight and keeping momentum is key to winning here. A popular course jockey at Hereford is Sam Twiston Davies having the best strike rate of recent times. Local trainer Paul Nicholls is also one to watch when making your selections. Richard Johnson had his first career win at Hereford in a Hunters Chase in 1994. Hereford has one feature race which is the Silver Salver Chase in October. The handicap race spans over 3 miles and 1 furlong. Over the next few years we can see Hereford getting some bigger races on the race card now the course has reopened. Follow our Hereford horse racing tips and start making profit today. Our tips and predictions for feature races include market movers on today’s runners. Our bets bonus ensures you get enhanced odds when using our daily tipping service. Today’s naps are available on our race cards, betting tips and previews. We have tips for UK and Irish horse racing and we recommend getting your racing bets on early when you see our racing news. We advise using a deposit bonus when betting on a horse racing fixture. A welcome bonus gets you the maximum profit from our bets of the day. Following our track guide, betting tips and previews from our horse racing tipster will make you start winning races today.